In order to remind fans thematically of the original Star Wars movies, Knights of the Old Republic (or KOTOR for short) had a lot of intentional similarities. From ships (Millennium Falcon = Ebon Hawk) to companions (a small rolling droid and a wookiee) and even some of the plot events, KOTOR did its part to make fans feel comfortable. That even extended to the game's main villain, Darth Malak (a tall, scarred former Jedi with a metallic voice) and his mysterious, hooded master, Darth Revan. Back when Revan was still a Jedi, the Republic was being invaded by Mandalorians, but the Jedi Council was reluctant to get involved. Fed up by their inaction, Revan sent out a call to arms, counting on his charismatic nature and the sympathies of his fellow Jedi to build momentum. It worked, and soon they had turned the tide of battle - Revan was a brilliant strategist, and soon he'd been promoted to command an entire third of the Republic's forces. Eventually Revan learned of a greater threat than the Mandalorians, and embraced the Dark Side in order to fight it. Though Revan is canonically male, choices you make in the game could reveal that "he's" actually a woman - thus, the character wears a gender-neutral outfit that covers his/her entire body. We already mentioned the hood, but it's attached to a floor-length cape. That's grey, matching the big skirt, as well as the smaller loincloth underneath. His breastplate, bracers, waist armor and front-skirt are all puce, while the armor over his shoulders is the same solid black as his sleeves and gloves. There are lots of straps and metal rings around his waist, and if you look under the robes, you'll find black pants, armored boots, and even more straps of cloth. The cape is a separate piece, easily removed, and underneath you'll find a bald white head. Revan is wearing a mask that conceals his identity: though it's similar to the design seen in the games, it's not an exact match. He should look out through a thin slit, not a full visor. The lines should be less vertical, and more angled. The colors should be darker, and there definitely shouldn't be a big red dot in the center. Overall, this looks more like a paintball mask than the one worn by the Sith Lord. 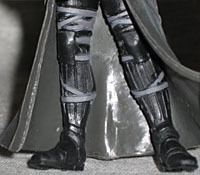 Darth Revan's articulation is nice. Since the legs are hindered by all those skirts, Hasbro didn't waste a lot of money articulating them - there are plain peg hips, but that's it. The waist swivels freely because the belts that cross it aren't sculpted or glued on, but part of the separate skirt. The wrists are swivels, and the elbows and shoulders are balljoints. The head is a ball and socket joint, so if it pops off, just put it back on. 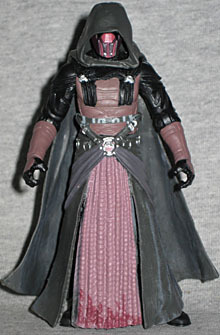 The figure stands fine as long as it has its cape on, but take that off and Revan will be tipping forward in no time. 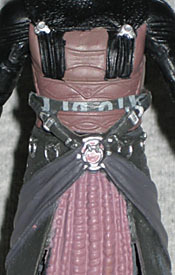 The figure includes two accessories: his red-bladed lightsaber, and a lightsaber hilt. Now, unlike some Star Wars figures that include a hilt so you can hang their lightsaber at their waist, Revan's actually carrying around his apprentice Malak's lightsaber. Maybe he took it away because Malak wouldn't clean his room. Nah, it's probably related to something in the game. Darth Revan's packaging proclaims that he was the ToyFare Fans' Choice figure, which isn't quite accurate (or is at least a bit misleading). Oh, he was on the 2006 ToyFare poll, but he didn't win. He came in second, behind Quinlan Vos, but since Vos was already on the production schedule, Hasbro took the #2 choice, which was a bit of a no-brainer anyway; were they somehow going to not make figures from one of the most popular SW games around? Most of the Darths in Star Wars have some kind of evil name: Sidious, Maul, Tyrannus, and so on. So how does Revan fit that profile? Well, the comics seem to have decided it comes from revanche, French for "revenge," but both those words share a common root with "revenant," the name for a person that comes back from the dead to accomplish some specific task - and anyone who's played KOTOR can see how that would suit Darth Revan. Whatever you want his name to be, Darth Revan is a good figure, even if his mask wasn't done right.